Los Angeles, Calif – TriCoast Entertainment presents Andrew Repasky McElhinney’s live action holiday musical CHRISTMAS DREAMS available for home entertainment via digital download and on DVD through Amazon and Wal-Mart. CHRISTMAS DREAMS is an enchanting movie for the whole family and features narration by Kevin Sorbo (GOD’S NOT DEAD, “Hercules”). 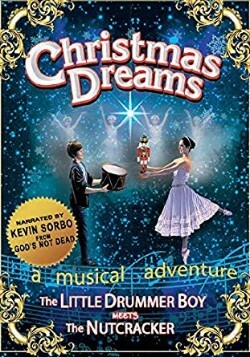 Reimagining the stories of The Nutcracker and the Little Drummer Boy, CHRISTMAS DREAMS projects the imagination of the Little Drummer Boy (Conrad Sager) and the Pretty Girl (Francesca Flamminio) as they awake on Christmas morning in an enchanting Christmastime world and embark on a jourey which reveals the most important lesson of all — it is greater to give than to receive. Inspired by holiday favorites like Tchaikovsky’s The Nutcracker ballet, this aesthetically pleasing, family-friendly film includes traditional Christmas favorites by composer Michael Rapp (“Rasputin”, “Masters of the Universe”). Narration by beloved actor and filmmaker, Kevin Sorbo, provides a trusted voice for the faith-filled Christmas journey. Also available is the CHRISTMAS DREAMS soundtrack featuring Michael Rapp’s chart-topping hit “Christmas Is For Kids”, among others, available on iTunes now. For more information, and to view trailers visit http://christmasdreamsthemovie.com.